Uk fashion graduates, are you ready? If you’ve studied fashion at undergraduate level in the UK, most likely you applied through the Universities and Colleges Admissions Service (UCAS). I searched ‘Fashion’ on the UCAS site, 105 relevant schools came up. Some offer one fashion course like the Arts University Bournemouth, others, anything up to 48, as with the University of the Arts London, collective of schools. There are 326 courses for fashion in the UK alone. Some of the smaller schools may have classes of around 15 to 30 students, while the bigger schools are likely to have 50 to 100 students in each year. Very roughly averaged to 50 students per year group would mean 16,300 students are looking for a job right now. I’m wondering where you are all supposed to go, and what’s needed to survive in such a highly competitive job market. Fashion is one of those subjects you might initially have liked to do because you love shopping. Ok, so that’s wishy-washy on it’s own, but it’s at least one sign that you enjoy fashion, a great place to start! You will quickly have learnt that a fashion course is no doss. By now, you will also have a steady body of work under your belt whether you’ve studied illustration, design, atelier, marketing, and photography… (the full list is too big to put here). You have also, hopefully, developed a point of view, as well as situating your work within the field of fashion and already successful designers. Now what? I attended this year’s Graduate Fashion Week, Earls Court in London, to gage the attitude of recent undergraduates’ industry expectations. I was interested to see the main sponsors, George at Asda, had dedicated their whole stand to helping students get a job. Working under the banner of “Let’s Talk” plenty of staff on hand to look at CVs and portfolios, as well as scheduled presentations on what its really like, at least in the retail sector of fashion design. We might as well face it, if you know you’re not the next Alexander McQueen, you have to shuffle yourself into a more realistic position, even if it’s just to get you started. If your dream is to have your own label, there’s a lot to be said from learning on the job first, making mistakes with someone else’s money, for starters! 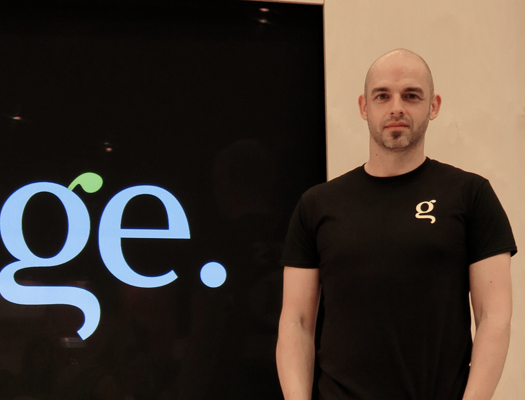 I’d like you to meet Simon Munden, the Design Manager for Menswear, George at Asda. He said, this year, George wanted to put “a motherly arm round Graduate Fashion Week”. I asked, if he thought graduates are coming out of universities fully prepared for the industry. What advice would you give to someone looking for a job now? Then I went out to meet some of you, the cream of the crop at GFW. This is Brittany, who told me “It’s been eventful, hard work, I’ve enjoyed every bit of it. It’s satisfying getting to the end, during it its just so hard. I suppose, sticking with deadlines, which I think was the worse thing for me personally but it’s so rewarding at the end!” Brittany then went on to tell me where she sees herself in five years. This is Amy, who told me how varied the Fashion Marketing course has been for her. 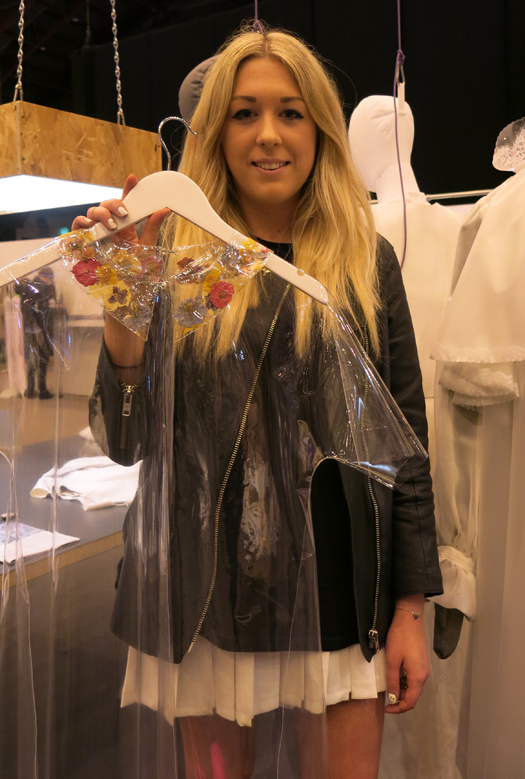 “It’s a diverse course, a little bit of fashion design, marketing, illustration, so it’s kind of a mix of everything.” I asked Amy if she felt prepared for the world of work. Students who have just finished studying the Atelier course, University of the Creative Arts, Rochester, include Hannah, Megan and Phoebe. They told me about the course, their focus and skills learnt. What would you say you need to be able to do a course like yours? How do you feel now the course has finished? You’ve had some industry work placements, what was that like? What advice would you give someone following in your footsteps into the fashion industry? 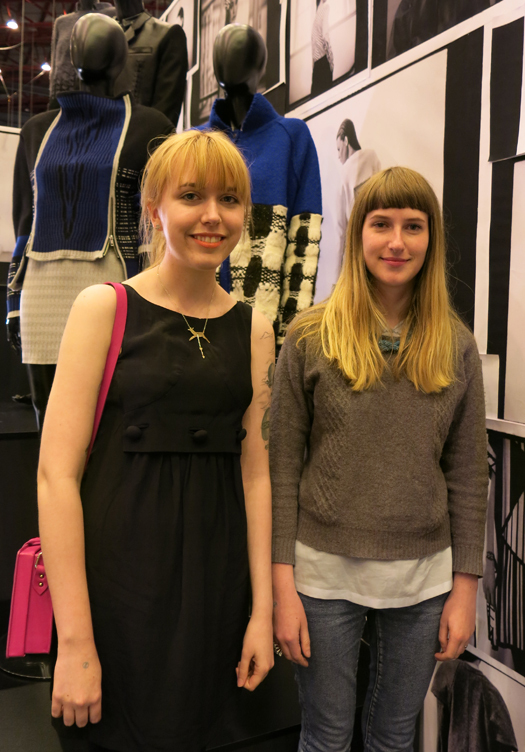 Then I met Clare and Rachel, who have just completed the Fashion Knitwear course at Nottingham Trent University. I asked them what advice would you give someone else looking to do the course, to help set them up for their future career. 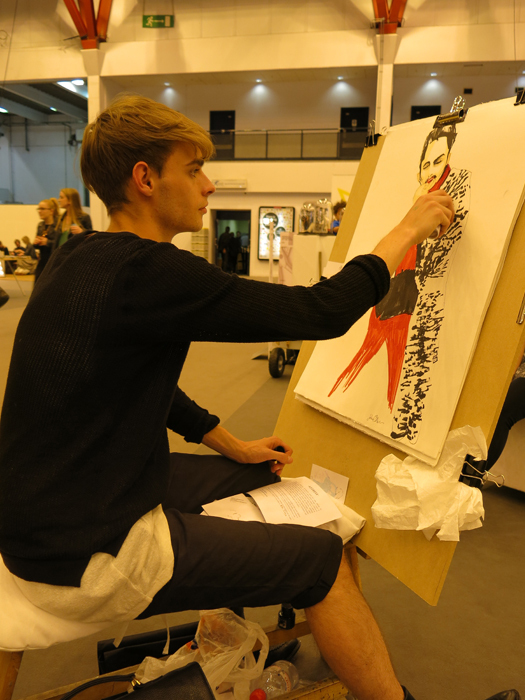 This is Joshua, who has just completed Fashion Studies at Bournemouth University. He said “The course really pushes digital print so people wanting to do fashion illustration can really fllourish. They focus on developing students’ own identites first. Managing work to live and study has been tough.” What’s your advice for people following in your footsteps? “Work as much as you can in the first and second year so you can really make the most of your final year.” And, what are your plans now Joshua? 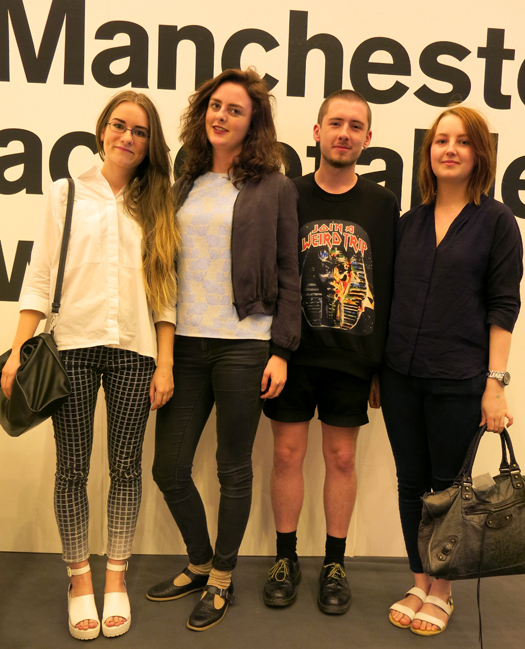 Four people representing Fashion Design from Manchester University are Caiti, Helen-Daisy, Daniel and Ria. 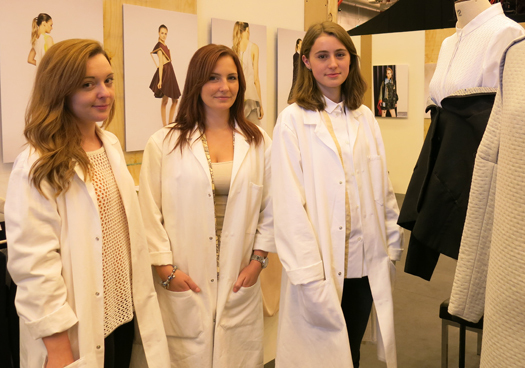 They said, they get to try everything; womenswear, menswear, knit, digital print before specialising. “We’ve had a lot of fun, It’s been fun, great fun!” “We’ve utilised different sources of inspiration studying in Manchester as apposed to London.” I asked them what they think the industry expects “A lot!” “Hard work!” “Constant churning out of ideas” and “Being flexible, being able to go into different areas, that might not necessarily be what you want to do as your main aim. Before you get where you want to.” Then they gave simple but very good advice! This is Emily-Jane, from Bath Spa University. 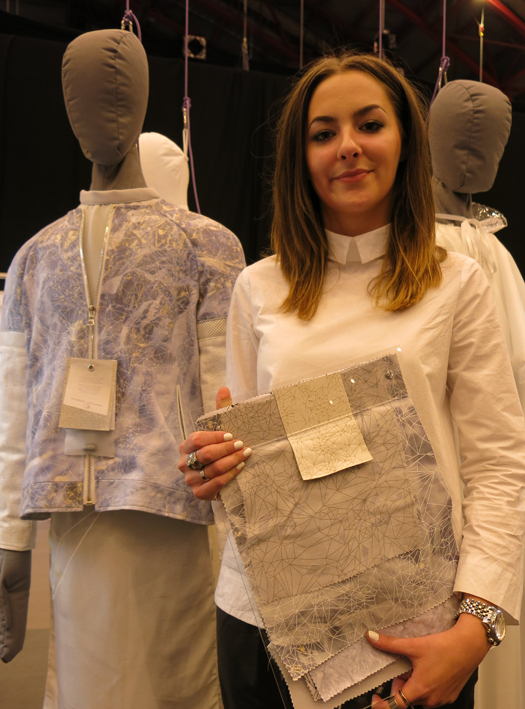 She says her course was strictly a Fashion Design course, 3 years. “Bath Spa is possibly one of the nicest places you could possibly be, we were based in a Georgian house. The place is stunning and inspiring.” She also said “It’s been stressful but worth it!” What skills did you mainly focus on that will be useful to you in the industry? What have you been taught to expect in employment? What advice would you give someone else looking to take up fashion as a career? Posted in IN CONVERSATION WITH… | Comments Off on Uk fashion graduates, are you ready?